General Info: Pernik is one of the manufacture centers in Bulgaria and is situated in picturesque lowland in the western part of Central Bulgaria. The town is placed along the upper flow of the Struma River. 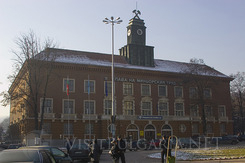 Pernik is one of the youngest and fast developing cities in Bulgaria. It was announced as a town in 1929 and its fast developing is due to the coal industry, machine- building and metallurgy. E79 highway passes through the city and transforms it into a majour transport junction. One of the oldest trade roads on the Balkans: Sofia – Thessalonica – Skopje, passes through the city. History: Pernik was first mentioned in an old legend about Ivan Rilski from X th century. The most popular legend about the origin of the name of Pernik is that it comes from the name of the ancient Slavic God Perun. 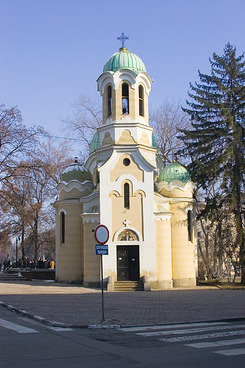 Places to visit: St. Ivan Rilski Temple- built in 1919. 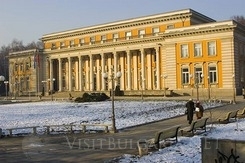 Historical museum Pernik offers expositions of archeology, ethnography and Bulgarian history. Collections of prehistoric pottery and evidences from the town’s lifestyle from the medieval period (exponats were found in the Krakra fortress), icon collection and etc. can be found in the museum. The mine museum- opened doors in 1981 and is being managed by “Pernik Mines” Joint stock Company. 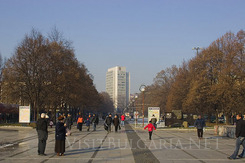 Several parks in the city provide pleasant atmosphere for relax or just a walk- Krakra, Druzhba, Stadiona and Golo Bardo. Krakra fortress is situated on a small rocky plateau in the southwestern part of Pernik in the “Karvavoto” Canyon of Struma River. 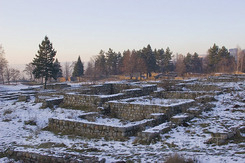 The oldest fortress equipment in the site was from the V-IVth century before Christ. The remains outline a multiple angled fortress on a total area of 45 decares. Rudartsi village at the foot of Vitosha Mountain is very close to Pernik, it offers beautiful nature, mineral pools and spa. Entertainment: The International Fest of the Mask Games takes place in Pernik each even year, during the first weekend after Vasiliov day (14 January). The festival highly supported by the public under the patronage of the Ministry of Culture and is the most important cultural event in the region. Over 3000 performers from all over Bulgaria and groups from al over the world manifest on the streets of Pernik. Pernik is a member of the Federation of the European Carnival Cities with centered in Amsterdam. The festival is listed in the international calendar of FECC. Numerous restaurants, bars and traditional mehanas offer delicious food and wide range of selected drinks in the city, if you just want to stop by and relax in Pernik. There are several hotels that offer comfort for the traveller.